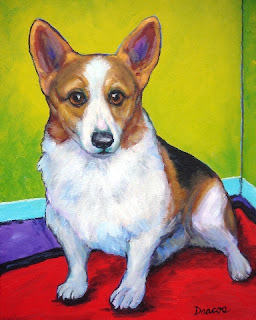 Here's one of the brightest paintings I've done of a Corgi named Pun'kin. She was a commission so is already sold. She's 9x12" acrylic on canvas, and she's available as a print or as a clock on my website, www.dottiedracos.com. Here's my latest painting I've done. It's been a while since I've been able to paint due to the ill health of a family member, but now I'm back at it again! 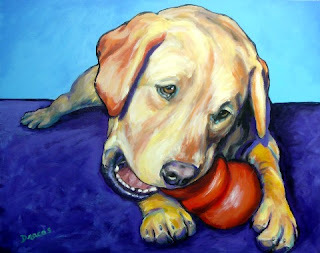 This little yellow lab is a brave, exciting new direction for me: larger canvases. He's acrylic on 24x30" canvas and sells for $400.00. He can be seen "in dog" at Club K-9, 7427 N Curtis Ave., Portland, Oregon , 97217, Phone: 503-289-7472. Prints are also available at my website, www.dottiedracos.com or www.wildwildthings.com. Here's Bowzer, a beautiful lab. He was painted on for me a rather large canvas, 24x30". He was a wonderful model, I think. He's already sold, but he's available as a clock on my website, www.dottiedracos.com. For the next few weeks, in addition to completing more commissioned paintings, I'll be doing a separate group of what I hope are really fun paintings for a little showing at a great coffee shop here in Beaverton, OR, the Iron Mutt. It should be fun; they'll all be for sale. 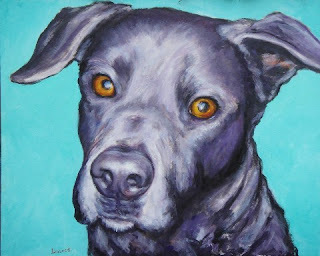 And some of the proceeds from the sales go to area animal shelters, such as Bonnie Hayes, where we adopted our most recent family member, our pomeranian, Harry P. Barker, Harry for short.